2014: Mimi Parent - "Queen of the Fish"
2013: Wassily Kandinsky - "Garden of Love, or Improvisation #27"
For the 2012 challenge we chose this black & white photograph of Ansel Adams (Factory Building, San Francisco, 1932), which we all will render in colour in our respective medium. 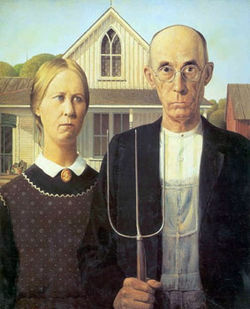 After ample deliberation the RipOffs have chosen Grant Wood's iconic image American Gothic for their next challenge. As this is our fifth year in existence, expect something even more out of the ordinary from this innovative group of artists! Interview on National Public Radio with Thomas Hoving, former head of the Metropolitan Museum of Art, on American Gothic. Watch how the RipOffs will stick it to Wood at the Quail's Nest Art Centre in Oliver from July 5 until July 9, 2011. For their fourth challenge, The Ripoff Artists came home to the Group of Seven, the quintessentially Canadian landscape painters. The group wanted a painting unlike the landscapes of Van Gogh, and settled on the cool, abstract landscapes of Lawren Harris. 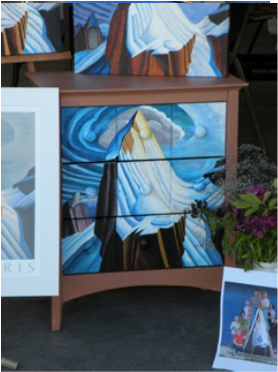 Lawren Harris is considered to be the leader of the Group of Seven. Most of the group, along with Tom Thomson, worked at a design firm in Toronto and began meeting to discuss art. They wanted to create a distinctly Canadian style of painting, based mainly on Scandinavian prototypes. Going on excursions to northern Ontario, they painted landscapes unique to the Canadian Shield. After Thomson's tragic death, the friends became a formal group in 1920. By 1930, their influence was so widespread, they disbanded and became the Canadian Group of Artists. Lawren Harris (1885-1970) was born into a wealthy family. He was able to devote himself to his art, and to his interests in Theosophy. His style became increasingly abstract, especially after a trip to the Canadian Arctic in 1930. After a messy divorce and remarriage to the wife of a friend, Harris moved to New Mexico, then to Vancouver, BC, where he died in 1970. Mt, Lefroy, in the Canadian Rockies, is visible from Chateau Lake Louise. In 1896, it was the site of the first mountaineering death in North America. The following year, the family of the fallen climber, Philip Abbott, invited a Swiss mountain guide to lead the first expedition to the summit in honour of Philip. Harris's painting of Mt. Lefroy (1930) shows the early signs of his move toward abstraction in its simple massing of shapes, but there are subtle touches that indicate his interest in spirituality and colour symbolism. After three years, the artists decided this was a tradition. They needed a name that could carry on from year to year. Based on the idea of "ripping off a dead artist," they chose The Ripoff Artists. For 2009, they chose "Pink Tulip" (1926) by Georgia O'Keeffe (1887-1986). Her painting style is different yet again from both Van Gogh and Klimt. Born in Wisconsin, O'Keeffe went to art school and became an art teacher. In 1916, some of her sketches were taken to Alfred Stieglitz, an influential art critic and photographer in New York, who became her mentor. O'Keeffe and Stieglitz married in 1924. In the late 1920's, she began painting powerful close-ups of flowers, influencing feminist artists for decades. O'Keeffe began going to New Mexico in 1928, buying a house near Taos in 1940. 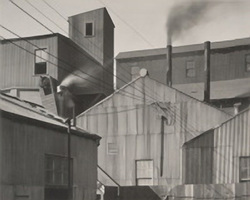 She moved there permanently after Stieglitz died in 1946. She went through many phases in her long career, including stark landscapes and a series of skull paintings, often with her signature flowers. In 2008, the artists from the previous year's Van Gogh Challenge wanted a painting as different as possible from Van Gogh's landscape. They chose a portrait by Austrian painter, Gustav Klimt. They took the name "Klimtomaniacs" for this challenge. Gustav Klimt (1862-1918) was trained in the academic style common in 19th century Europe. In 1897, he was a founding member of the Vienna Secession movement, which promoted new & unusual painters. His academic training is seen in his sensitive defined faces and anatomy, combined with intricate, stylized, flat surface decoration. Klimt's favourite subject was women. Emilie Floge (or Floege) was his companion for many years, though it's not clear if they had a sexual relationship. He painted this portrait of her in 1902. Our Very First Challenge!The artists who formed the first Ripoff challenge in 2007 chose Van Gogh's "Wheatfield with Cypresses, Early September 1889" because of its similarity to the South Okanagan. Tall evergreens, grassland, craggy hills, fluffy banks of cloud and intense coloration - dark green, silvery sage, bright blue sky, golden grass and purple shadow - are common to the landscape around Oliver, and to the countryside in Provence, where Vincent painted this scene. Dutch painter Vincent Van Gogh (1853-1890) is considered one of the fathers of modern painting. His style is noted for lively, expressive brushwork and vivid colour. His style was at its best when he lived in the town of Arles in Provence, in the south of France. He's infamous for cutting off part of his ear during a bout of mental illness, and died at the age of 37 after being hospitalized several times. He never sold a painting and was supported by his brother, Theo. After his death, his work influenced generations, and he is now one of the most recognizable and best loved artists of all time.